Retrobok unearthed a superbly detailed article about the history of the Foster family and Reeboks’ roots. 2 facts stand out most: Reeboks’ track success can be traced back to Cricket shoes, and for a short period JW Fosters and Reebok were rival companies. “When Samuel Foster took over the family business from his father in 1829 he had little or no idea of what a significant part in history he would play. 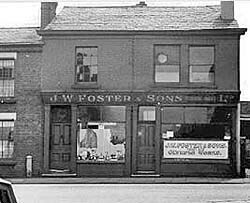 The Foster family had been cordwainers in the small village of Sandiacre, Nottinghamshire for generations making shoes for the local gentry and middle classes. In 1862 a man walked through Samuel’s door who was going to change that forever! Samuel Biddulph was the brightest star of Nottinghamshire cricket and he was looking for an edge over his competitors, the hobnails on his white shoes simply didn’t bite into the hard ground when he was using the new over arm fast bowling technique he had developed. The Two Samuels hit upon the idea to make the nails longer and pointed (Spikes). Sam Foster approached the local blacksmith Thomas Towel with the idea and he agreed to make some short flat-headed nails for Sam to use in Biddulph’s shoes. Biddulph and Foster were the main topic of conversation throughout the 1863 season and cricketers from far and wide travelled to Sandiacre to buy Sam Fosters cricket shoes. 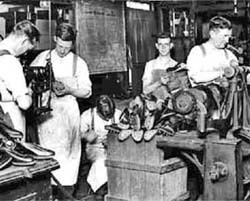 For the next twenty years Sam continued to make his cricket shoes and made early shoes for Golf and new sports such as football. Sam’s three nailed studs were legendary in Nottingham and the surrounding towns. Events took a twist in early 1890 when his young grandson Joseph came to visit. Both young Joe and his older brother were keen runners and they immediately saw that a pair of their grandfathers shoes would give them an advantage on the track. Joe was not content though and set to work in his bedroom above his father’s confectionery shop at 90 Deane Road Bolton, removing the heels and stripping weight from his shoes. Joe stayed with his grandfather the following year to learn how to make shoes and continued to evolve his design. Sam died the following March and young Joe returned to Bolton with his grandfather’s tools and knowledge. His fellow club runners marvelled at his ‘RUNNING PUMPS’ and he found himself with a fist full of orders at every race he attended. He set to work in his father’s back yard, making shoes for local athletes. Results on the racetrack and word of mouth spread the news. 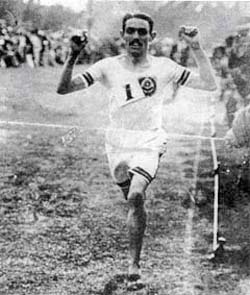 In 1904 the legendary Alf Shrubb, blistered down the track at Ibrox Park, Glasgow, smashing three world records in one race wearing Joe Foster’s Pumps. Within four years Joe’s Pumps were renowned as the best and worn by the best! By 1910 demand had grown to such an extent that he had to expand next door and create the world’s first athletic shoe factory. In ‘the Olympic Works’ girls toiled on new fangled sewing machines, while highly skilled artisans fitted spikes and hand-sewn welts to create the shoes that graced the feet of the world’s fastest. In 1914 the wearers of Foster’s Shoes wore medals for valour as the Olympic Works turned to making and repairing Army boots. My twelve year old great-grandfather had the grim job of washing Flanders mud from returned boots in an immense tub in the back yard. “I remember when the water wasn’t grey but red!”, he used to tell my father. Peace returned, and, at the 1924 Olympics the two British stars, Harold Abrahams and Eric Liddell, immortalised in the film ‘Chariots of Fire’, duelled on the track in Foster’s Running Pumps. He earned notoriety as the ‘Captain’ when writing the athletics column in the Bolton Evening News. He never passed up the chance to promote the family business! In 1933 Joe died suddenly and left the business to Billy and my great-grandfather, who expanded into the wider sporting world. By the early ’50’s Foster’s Rugby and Soccer boots graced the feet of many of the top players from Manchester United, Liverpool, Newcastle United and Bolton Wanderers. Their fame was such that when the Moscow Dynamos team made its first trip to the West they all stopped by the Olympic Works, to be personally fitted with new boots. The notorious hand sewing of welts began to be done by machine, but ‘studs and spikes must still be fitted by hand to the specification of each customer’, they were instructed. At the 1958 FA Cup Final Nat Lofthouse scored the winning goal for Bolton Wanderers in Foster’s boots. That same year my father and uncle left under a cloud to found a new company ‘Reebok’. For my grandfather and great-uncle the story was very different. Reebok was establishing its own reputation with its own records and medals in the major games. 200,000 pairs found fame on the feet of the world’s athletes every year. In 1981 they were rated number one for quality by Runners World Magazine. Their foresight, and dedication to product development and performance, ensured continued success. Throughout the 70s and 80s Reebok remained very much a family firm, with my grand mother, great-aunt, and my grandfather’s younger brother, John, all working for the company. 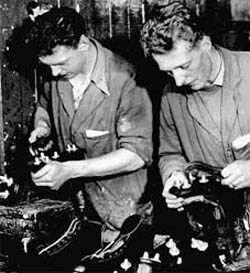 My dad’s apprenticeship started early, with school holidays spent making boxes, cementing soles, and lacing shoes. His weekends were adventures to muddy fields and hillsides, selling shoes to athletes at races. My dad began to work full time for my grandfather in 1983 becoming the sixth generation of Foster’s to hand craft the finest running shoes for the world’s greatest athletes. My grandfather sold Reebok in 1984 to the American distributor, but my father continued to work for them until 1993, when he returned to Bolton. 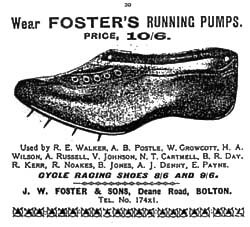 Posted on March 27, 2012, in Newsfeed and tagged Bolton, Foster & Sons, Foster and Sons, Fosters Famous Shoes, Fosters Running Pump, Fosters Running Spike, J W Foster, JW Foster, Olympic Works, Reebok, Retrobok. Bookmark the permalink. 2 Comments.